Organize your shower with this 4-Tier Corner Shower Caddy. The caddy's 4 large shelves easily hold shampoo, conditioner and other containers. Its enamel-coated tension poles resist rusting and chipping for long-lasting use. ARB Teak products are made from responsibly harvested grade A' teak - dried to perfection and beautifully finished. We use only the highest quality hardware made from solid brass and stainless steel, meaning no rust. The modern and durable rust-proof design of the Monsoon Shower Caddy by Artika brings organization to any bathroom. Complete with adjustable shelves, baskets and racks this caddy provides customizable storage solutions for every family member's needs. An extendable locking mechanism and premium stable foot ensures a snug fit in any shower or bath. Upscale design, maximum functionality and exclusive Chrometherm. coating, for this new line of bathroom accessories. ORBIT line, made up of different shelves with chrome look and practical ceramic-white plastic containers to store all kid of objects and bath products. Designed to be hung or simply placed wherever desired over the bathroom countertops. Flex was designed to take up minimal space in the shower while still accommodating larger bottle sizes. The flexible silicone bands inspired by bungees used for truck tail gates stretch to fit your favourite shower products. Two shelves have an incorporated soap dish and silicone straps to store razors. This unique shower caddy is "FLEX"ible in mounting configurations. Mounts over the shower head or over the door. 4 Shelf Pole Caddy -White Organize your shower with this 4-Tier Corner Shower Caddy. The caddy's 4 large shelves easily hold shampoo, conditioner and other containers. Its enamel-coated tension poles resist rusting and chipping for long-lasting use. 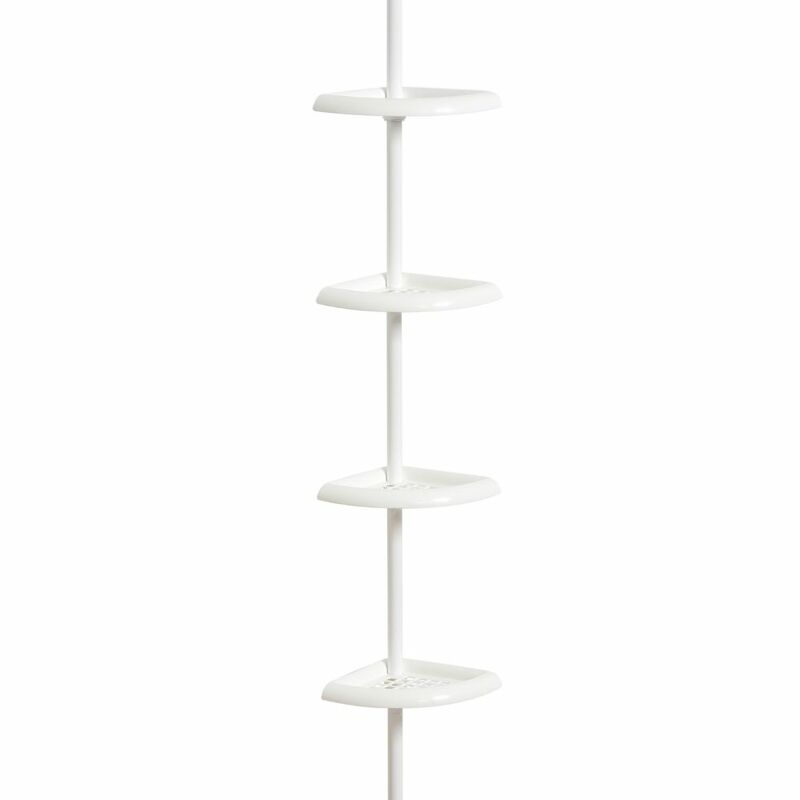 4 Shelf Pole Caddy -White is rated 3.9 out of 5 by 80. Rated 4 out of 5 by BusyMom5 from Easy to assemble and adjust to fit in my shower. Looks good, and goes easily with my decor. Easy to assemble and adjust to fit in my shower. Looks good, and goes easily with my decor. Rated 4 out of 5 by Bob from Easy to assemble, price is right and it is hard to find these items in white anymore. Now it is u... Easy to assemble, price is right and it is hard to find these items in white anymore. Now it is usually chrome or brushed nickel. Guess I need to upgrade my bathroom......again? Rated 3 out of 5 by Mada from Average product, little flimsy. removed old version and the metal was way thicker and sturdier. I... Average product, little flimsy. removed old version and the metal was way thicker and sturdier. It functions as it should. Those complaining about lack of instructions may be a little slow, this was pretty straight forward to put together, the tricky part was the two small end tips that actually get inserted into the spring ends, took me a second to figure what to do with them, but once i put them in it made sense. everything else was pretty simple. put the tubes together tape them, slide shelves onto pole space out where you want them and then insert self inserts make sure to place the correct direction there is a thick rim on one side that edge faces downward when sliding into shelf bottom, place spring into top piece use black spacers to lengthen or shorten pole length, insert final top piece. Make sure to measure height, because using different length poles will adjust total pole length along with spacer, not really hard to figure out even trial and error will work without measuring, which is what i did and figured it out on first try. wish the poles were a little stronger, but it does the job and holds up all the shampoos and supplies in shower. would by again, but this should really be about $10-$15 tops. but it works and will do as an option. Rated 4 out of 5 by Anonymous from Having purchased this shower stand in the past, I learned some things; the stand is lightweight a... Having purchased this shower stand in the past, I learned some things; the stand is lightweight and will rust out at the joints. After assembling stand and installation I coated the joints and bottom end cap with Flex Seal or similar (put cardboard behind) and used a piping support clamp to mount to the wall. Hopefully, this will cure problems with this stand, otherwise, buy a stainless steel stand, because all others rust out. does this fit in a standard step in bathtub? &nbsp;or is it just for a stand up shower with no tub?